Do you find homeschooling during December to be overwhelming? I’m Wendy, one of the owners of Hip Homeschool Moms. Lately I’ve heard from lots of homeschooling moms who wonder if they should take off the entire month of December because of their busy holiday schedules. They are find it nearly impossible to do school, handle the house and laundry and all of those things that must be done on a regular basis all year round, and take care of so many holiday-related responsibilities. It is my honest opinion that it’s perfectly fine to take off December if you want or need to do so! 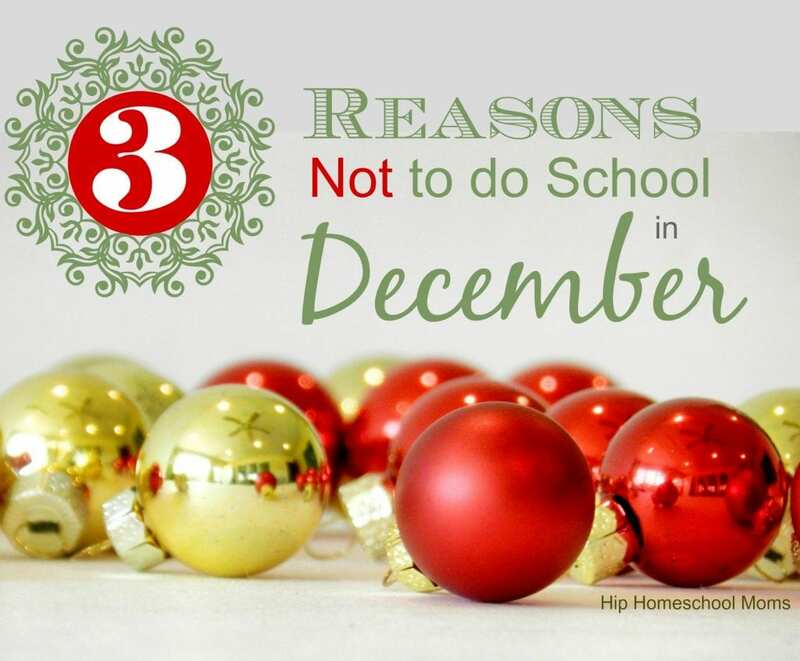 I’ll even share with you 3 reasons NOT to do school in December. Keep in mind that choosing not to do school during December doesn’t mean your children won’t be learning! In fact, they’ll be learning lots of important, valuable skills and information that they’ll need as adults for their own families. There are lots of things that your children can learn during the holidays even without doing regular school work. #1 Teach them to care for others. First of all, our children need to learn to love and care for others. What better way could we teach them than to let them see us doing those very things? If we are too busy with school to do things with or for others during this holiday season, then we definitely need to make some changes! I think of it this way: One of my main reasons for homeschooling my children is to teach them to be Christians who make a difference in the world. Sure they need to be well educated. But, as I’ve mentioned before, I’d rather they be good Christians than good students if I had to choose one or the other. #2 Teach them good money management skills. Christmas shopping provides a wonderful opportunity to have our children (especially older kids) practice skills such as making price comparisons and budgeting. These skills are often neglected, and your children will definitely benefit from learning them at a young age! If I’d had some practice at those before I got married, it could have kept my husband and me from making some very unwise financial decision during the first few years of our marriage. Grocery shopping and meal planning help not only with budgeting but also with developing the skills needed to keep an organized and smoothly-running home. (And this is another area in which they can practice making price comparisons and budgeting!) This is will not only benefit you right now, but it will also be a wonderful skill for them to have when they get married and have their own families one day. Baking holiday treats is a great way to develop creativity, show love and care for others, and even work on math skills! Most children love helping with baking and decorating holiday treats! One of my younger daughter’s favorite things to do each year at Christmas is help me make a gingerbread house. She’s not only having fun, but she’s also using her imagination and creativity! It’s great “exercise” for our brains to be creative and artistic. It’s also a wonderful way for our children to learn to love and care for others–whether it’s a family member, friend, or someone who’s sick and needs a little extra cheer this Christmas. And of course it’s an opportunity to work on math skills too! #3 Help them strengthen family and sibling relationships. Being with the family and working together on holiday activities, traveling, house cleaning, or taking care of whatever other responsibilities we have is a good time for our children to work with us and their siblings to foster closer relationships with each other. I’ve been talking to my children lately about the fact that God put each of us in this family for a reason. He wants us to be a team. He wants us to love and support each other. Whether we’re doing holiday cleaning, cooking, buying gifts, decorating the Christmas tree, wrapping presents, or attending church or community Christmas events, we should support each other and work as a team. This is a perfect time to talk about those skills and then practice them! If you look at it this way, you’re not really taking the month of December off at all. You’re just doing a different kind of teaching and learning, and that’s a good thing! If you’d like to read more about options for homeschooling and continuing to learn during December even if you take the month off from “formal” homeschooling, you’ll enjoy this article called ADVENTure School. But be sure to leave a comment on this article first! We’d love to hear from you! Do you take December off from formal school? Tell us why you do or don’t take this month off. What other kinds of activities do you keep busy doing instead? We are not taking the entire month off because we need the routine days of school. This past year we had many many non-routine days because my husband had a heart-transplant. Too many of those days make life hard, so we’re enjoying the comfort of having routine in our days. That said, we’re stopping formal schooling December 14 because we also want time to enjoy the season. During our break we will bake, make ornaments, prepare for hosting a large family celebration, and simply rest. In my experience, it’s all about balance and what works for your specific family this specific year. Becca, I hope your husband is doing well after having had his heart transplant. It’s no wonder that your school routine was off last year! Some years we go ahead and do school for the first couple of weeks or so of December. Other years we take the whole month off. It’s a wonderful advantage of homeschooling to be able to tailor our schedules to work best for our particular family! Thanks for your comment. Valerie, we do that sometimes too. Other times we just try to do an extra day of school each week or something like that. WOW!! What a great idea, public schools usually take the last week and a half off and they haven’t done nearly as much as a Homeschooler. We tend to begin to double up on some subjects right after Thanksgiving up until the tenth, then stop with our traditional way and do some of the things you mentioned, making homemade cards and gifts and baking and caroling and practicing those great math skills when shopping . Great article, Merry Christmas!! Thanks so much, Annette! Merry Christmas to you too! I wish I read this before I had already decided to take the month off, maybe I wouldn’t have felt as badly (although we are continuing in some small areas where the kids had fallen behind.) Our major reasons (including yours above) are we do tons of crafts, cookies, and making our own present. My son wrote a short novel for someone, and although I have to proofread it and help him with some of it, I feel like if he wants to write a novel, why should I force him to write a 5 paragraph essay? Plus he made someone a pillow and learned how to sew. Today my daughter is learning how to make earrings for presents, and we’ll be making potholders this week, too! It may not be typical school but we’ll be able to focus on making gifts and spending our reading time with Christmas books, singing, etc… Thanks! I’d love to take December off but that’s to an uncommonly large amount of doctor appointments I already feel like I’m so far behind what I had mapped out for the year. We’re two weeks behind to be exact and it’s making me feel like a total failure. This is only our second year homeschooling and I know that there are always setbacks but I have a highschooler. There’s this sense of urgency and importance in getting everything right and on a schedule. How do you guys handle when you can’t keep up with the plan? One thing I do when we fall behind is simply double up some days. Or we might simply do an extra science lesson every day one week and an extra history lesson each day another week. Occasionally we decide to do school on a day that we would have otherwise been off. I’d encourage you to try not to be discouraged and to just see where you can make up some classes here and there. As you homeschool over the years, you’ll learn not to let small setbacks discourage you. I think most new homeschooling moms feels so much more pressure! Blessings to you and your family! Please stop by the Hip Homeschool Moms Facebook page to ask any questions or ask for suggestions if we can help you! I, too, struggle with the feeling of urgency with two high schoolers and two middle schoolers. We had lots of doctors appointments last year and it felt so disjointed. I was determined to have more routine this year. A few of my homeschool friends went to school this year and it was a good reminder of how much “off routine” activities happen. Along with not finishing textbooks, pep rallys, speakers, teacher workdays fill up a lot of their weeks. It was a sweet reminder that our crazy schedule at home isn’t so different than high school. I’m looking forward to taking December off! I think on of the great advantages about homeschooling is being able to teach in seasons instead of periods. We can have a history day, or a science week, or even a home economics month. That more closely reflects real life anyway! I go into my planner when the day is through… even when we take “days off” and count the time that she read her fav book, helped w/dinner, played outside, went to dance lessons, volunteered at the library… Why not?! She doesn’t know I am and it all counts toward her education, so I track it. Per NC law, I don’t HAVE to, but I do. We continue to do school thru the month of December, however it is a bit more lax than normal. This time of year is busy for my daughters dance schedule, in addition to the normal hectic schedule the holidays bring. There are multiple recitals, dress rehearsals and practices which we have to accommodate. The weather is beautiful this time of year where we live, so I also allow for more outdoor time to compliment our school day. Nothing like walking to the park with Christmas carols playing on Pandora! We have off from school outside the home but I view this time as a time that he could possibly regress. It takes soo much time to learn skills and he works 3 times harder than most kids to learn skills that we ‘homeschool’ every holiday and summer. (With the exception of the first half of last summer). Im so glad we do this! Every Christmas break we do full days of study of a few given skills that need the most attention and Every year his test scores have went up just after break!! It’s just what we need to do for youngest son. My daughter was gifted but that’s what mamas should take from your post. There’s no right or wrong in doing what’s best for your child? Love the encouragement you gave here! You are absolutely right! Some children need the time over summer and holidays to keep practicing and can’t really take much time off without regressing. My oldest child (who is autistic) didn’t enjoy time off. It wasn’t fun to her to be off her regular routine. It was also hard for her to regain lost skills. My other children don’t regress with short breaks. In fact, they thrive after being able to take time off now and then. But one of the best things about homeschooling is being able to do what’s best for our children! Thank you for your comment! This is our first year homeschooling and I had planned to take 2 weeks off formal schooling but next year I am going to plan not doing any official work during the month. We kind of do this s year. If events come up we take a break, even if just for a few days. ?. Good advice! Thanks. Yes! We will still work on a lighter schedule, but with both kids birthdays in December, and at least 8 Christmas parties, I want to also have time to relax and enjoy the season, and have time to decorate cookies and do crafts and focus on Christ. We do not take Decemeber off. I never considered it, actually. It is something to think about! We usually take a few weeks off at other times for visiting family out of state, so my concern is that we would get too far behind. We are actually planning to do this this year for the first time. We just switched to year-round schooling last year, which (I think) will make it easier to implement. Every year we wind up getting behind in December anyway & then playing catch up in January. This year we won’t have to worry about that! Great Ideas ❤️❤️ ‘Tis is the season ? Good ideas. We take off 2 weeks but i need to be better about thinking of learning experiences outside the classroom. I like your thoughts on helping others more. We generally take the whole month away from our normal routing. We do the 25 Days of Christ, bake cinnamon rolls for way too many people, sing lots of Christmas music, and then do all the things that happen – parties, recitals, hosting family. Love it all! I may have our kids take off the time. They would still be learning without being tied to working on specific tasks. We have decided not to do too much school work during the month of December. We’re still covering math and reading but focusing more on our Advent activities, art, baking, field trips, and volunteering at church and the local food pantry. Our family really needs this and I think it will help our girls with character building. So if you don’t do “school” for the month of December, and you live in a state where you have to have so many days of school how do you handle that? Do you count it as school still since they are still learning? Or do you add more time into your school calendar? I would love to take an entire month off from formal school! However, in order to fulfill our required number of days, by the state, we would be doing school in summer months. They are very precious to us as our summers are pretty short. We are doing extra works (which I will count) so we can have the whole week of Thanksgiving off. I’m still working out how to shorten the school work in Dec.
I’m definitely relaxing this holiday season. We will be focusing on family traditions and learning about our heritage. Lots of learning through experience with tons of baking and crafting. I’m glad I am not the only one taking a break! Number 3 is so important. I must remember to intentionally be like this for the month, no matter what kind of stressful days I have. We did this more when my kids were younger. Now they have more independent activities, so we only take a week off. I really treasured that time we spent together, they missed no learning opportunities. I struggle every December with trying to fit ‘school’ into the schedule. This year we are not doing it. Yet, another perk of homeschooling – no school in December! We homeschool year round so this will be easy to do. Thank you for the inspiration! I love this. We don’t take December completely off. But we do much less formal school. With Christmas cars, baking for friends and other activities we have for the holidays they are learning so much even if it is just about balancing relationships and family time. Yes to all of this! We are always learning, so when people ask if we take time “off” that’s what I tell them. Learning is a way of life. There’s no on and off switch. Great article! We take December off too! 😀 We year round home school 6 weeks on one week off. And December is our holiday break from school! With traveling to family and all the Christmas activities it seemed the best option for our family! 🙂 I love all the reasons you included in taking December off, those were my thoughts exactly!